Discoid lupus erythematosus is a chronic dermatological disease that can lead to scarring, hair loss, and hyperpigmentation changes in skin if it is not treated early and promptly. It has a prolonged course and can have a considerable effect on quality of life. Early recognition and treatment improves the prognosis. The diagnosis is usually made by clinical examination. In some cases histopathology may be required to confirm the diagnosis. 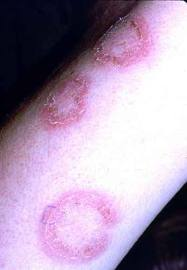 The histology is that of an inflammatory interface dermatosis. There is insufficient evidence for which treatment is most effective. Because lesions are induced or exacerbated by ultraviolet exposure, photoprotective measures are important. Potent topical steroids and antimalarials are the mainstay of treatment. 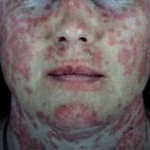 Some cases of discoid lupus erythematosus can be refractory to standard therapy; in these cases retinoids, thalidomide, and topical tacrolimus offer alternatives, as do immunosuppressives like azathioprine, cyclosporine, mycophenolate mofetil, and methotrexate. Lupus erythematosus (LE) is thought to be an autoimmune disease among other connective tissue diseases like scleroderma, rheumatoid arthritis, polymyositis, and mixed connective tissue disease. Within the spectrum of diseases included in LE, at one end is a disease confined mainly to the skin and referred to as discoid lupus erythematosus (DLE) and at the other end is a florid disease with systemic involvement of heart, lungs, brain, kidneys and other organs called systemic lupus erythematosus (SLE). In between the 2 ends of the spectrum are disorders like subacute cutaneous lupus. 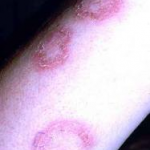 Subacute cutaneous lupus erythematosus (SCLE) has a rather sudden onset with annular or psoriasiform plaques erupting on the upper trunk, arms, and/or dorsa of hands, usually after exposure to sunlight. Although at the benign end of the spectrum, 1% to 5% of patients with discoid lupus may develop SLE and 25% of patients with SLE may develop typical chronic discoid lesions at some time during the course of their illness. Lupus occurs in all age groups with a mean age varying from 21 years to 50 years and a prevalence of 17 to 48 in 100,000, with a greater prevalence in Afro-Caribbean people. Although LE is an autoimmune disease, it is thought to result from an interplay of certain genetic factors, environmental factors like ultraviolet light, and hormonal factors with antibodies. The diagnosis of discoid lupus is generally made based on clinical features. Histology may be required to confirm the diagnosis; it is that of a lichenoid tissue reaction with changes at the dermo-epidermal junction that include thickening of the basement membrane (best demonstrated by periodic acid-Schiff staining) and vacuolar degeneration of the basal cells along with perivascular and peri-appendageal inflammatory cell infiltration of a variable degree in the reticular dermis. Hyperkeratosis is more evident and follicular plugging may be seen in more mature lesions. DLE tends to run a less severe course than SLE and has a better prognosis. It is important for family physicians to recognize DLE because it is a potentially scarring disease. Early referral and institution of treatment by dermatologists increases the hope of minimizing the progression of the disease and consequent socioeconomic impact on the individual. Early effective treatment may lead to total clearing of skin lesions, but failure of treatment results in permanent scarring; the depressed scars, hair loss, and pigmentary changes are often extremely disfiguring, particularly in darker-skinned people. According to a 2004 systematic review of treatment of discoid lupus by Jessop et al only 30 trials were identified through a search of the Cochrane Clinical Trials Register (December 1999); Medline (January 1966 to December 1999); Embase (January 1980 to January 2000); and Index Medicus (1956 to 1966). Only 4 of these were controlled trials and only 2 of the latter were randomized (A, level 2). Accordingly, more evidence is needed to guide clinicians to the best treatment options for DLE, particularly for the severe type. The treatment of DLE would in most instances be initiated at a dermatology department, but before instituting treatment for discoid lupus patients should be assessed for systemic involvement. This should include a full history and physical examination, full blood count, erythrocyte sedimentation rate, midstream urine, and antinuclear antibody. If SLE is suspected, anti-double stranded DNA, extractable nuclear antigen, C3/C4, and renal review should also be included. It should be noted that most of the above treatments are not FDA-approved for cutaneous lupus. This entry was posted in Rash, Skin Problems and tagged dermatological disease, Discoid lupus erythematosus, hair loss, hyperkeratosis, hyperpigmentation, lichenoid tissue reaction, periodic acid-Schiff staining, photoprotective measure, scarring, systemic lupus erythromatosus, ultraviolet exposure on June 11, 2012 by alwin.